Include the undercarriage in your daily walk around inspection prior to operation. Plan your job to even out turns. Operate with the terrain to even out wear. Match track shoes to underfoot conditions. Ensuring maximum life from the undercarriage system requires a team approach on the part of the manufacturerr, the dealer, and the end user. Getting Geared Up for Spring! Once again springtime is rolling around, and companies are gearing up for the busiest season of the year. This is the time of the year when road work crews, construction companies, farmers, and demolition companies are beginning to spend money so they can make money. Are you prepared with enough inventory for sales or enough cash flow for purchases? If your company is in need of customized machinery for either inventory or a job, remember that PWCE is geared up to help you. By definition, service means: installation, maintenance, or repairs done or guaranteed by a dealer or manufacturer. ....Here at PWCE, we consider our customer service top notch. We provide before and after sales service, starting from your first phone call through the life of your new product. ....After sale service consists of immediate problem solving, all warranties and replacement parts processed quickly and same day shipping on most parts so that the customer is up and running ASAP. ....We also address new products in a timely manner and are capable of scheduling in projects for fast delivery. If you have a question about installation or maintenance and cannot reach us by phone or fax, try our website for frequently asked questions and hints. LBX Company, makers of Link-Belt Excavators, announced the addition of an articulated dump truck line during the AED meeting held in Chicago. In a move that will create the world's largest manufacturer of forestry equipment, Deere has acquired the Timberjack Group from the Metso Corp. for $600 million. A computer simulation game, Construction Zone, has been introduced by Caterpillar and Matchbox. The realistic 3-D environment allows operators to choose from different CAT machines to tackle challenging missions in construction, demolition, farming, or logging. PWCE, Inc. is on the road to building more market share with the addition of another dipper extension. The Extendable Paw was designed and built to provide the extra reach needed for compact machines. The Picture above shows a Takeuchi TB145 mini-excavator equipped with a 3 foot Extendable Paw. * Grainger's site includes an online catalog and ordering system along with an online auction service. * National Work Zone Safety Information Clearinghouse maintains this site to help you get answers to work zone safety issues. * This site contains all the latest information on the industry. Engine: Look for oil or water leaks. Center Pin: Look for wear by up and down movements. Cab: Record machine hours and check all the little things. Linkage: Check for excessive sideways movement in all pin areas. Coupler/Bucket: Look for wear on bucket sides and cutting edges. Frame: Inspect for cracks and rust. Tires: Measure tread wear on all four tires. Brakes/Axles: Check for shape and wear. Serial Numbers: Record both the machine and engine numbers. Cooling System: Examine the radiator cooler core for damage or leaks. on how to inspect a used wheel loader. ....Year after year, silt settles into low current areas of a river bed. The silt causes problems for all inhabitants including boaters. To avoid problems, the silt needs to be manually removed. 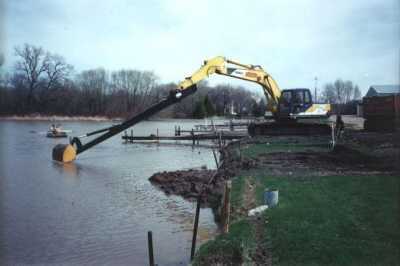 ....To successfully bid on a dredging job for a marina in Wisconsin, Semenas Trucking and Excavating needed a machine that was capable of reaching out and removing the silt. Additional reach for their current machine is what they needed and what PWCE provided. 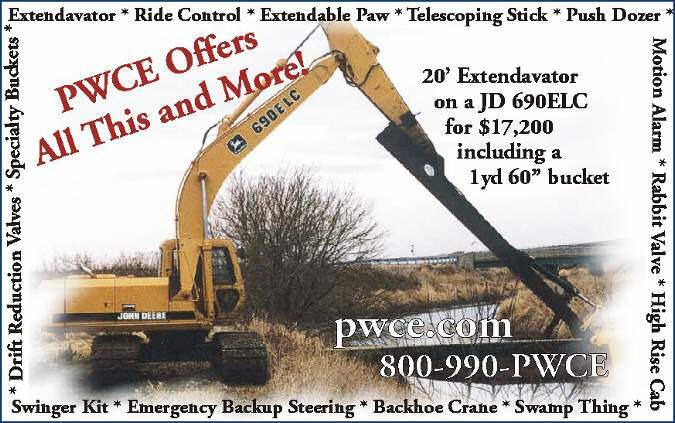 For a fraction of the cost of a new machine, a PWCE Extendavator was put on their Kobelco Mark III SK200 excavator. Benefits specific to this company include: 1) can be taken on or off depending on the job, 2) regular work capacities, 3) water tight, 4) can be used on another machine in same weight class, and 5) it requires no operator retraining. ....If you find yourself in a similar situation of getting or not getting the job, we may have the answer for you!